From the ritual object which functions as a substitute for the dead - thus acting as a medium for communicating with the ’other world’ - to the representation of death, violence and suffering in media, or the use of online social networks as spaces of commemoration, media of various kinds are central to the communication and performance of death-related socio-cultural practices of individuals, groups and societies. This second volume of the Studies in Death, Materiality and Time series explores the ways in which such practices are subject to ’re-mediation’; that is to say, processes by which well-known practices are re-presented in new ways through various media formats. Presenting rich, interdisciplinary new empirical case studies and fieldwork from the US and Europe, Asia, The Middle East, Australasia and Africa, Mediating and Remediating Death shows how different media forms contribute to the shaping and transformation of various forms of death and commemoration, whether in terms of their range and distribution, their relation to users or their roles in creating and maintaining communities. With its broad and multi-faceted focus on how uses of media can redraw the traditional boundaries of death-related practices and create new cultural realities, this book will appeal to scholars across the social sciences and humanities with interests in ritual and commemoration practices, the sociology and anthropology of death and dying, and cultural and media studies. 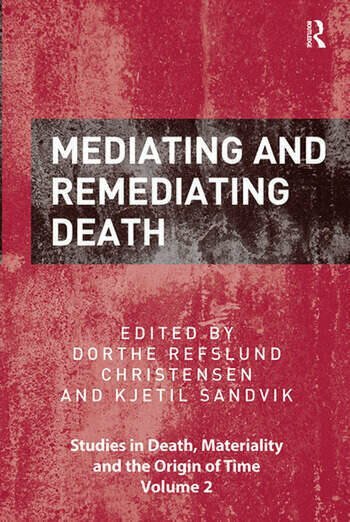 Dorthe Refslund Christensen is Associate Professor of Cultural Studies at Aarhus University, Denmark and co-editor of the series Studies in Death, Materiality and Time. She is co-editor of Taming Time Timing Death: Social Technologies and Ritual, the first volume in the Studies in Death, Materiality and Time series. Kjetil Sandvik is Associate Professor in the Department of Media, Cognition and Communication, at the University of Copenhagen, Denmark. He is head of the Cross Media Communication study program and the research project Meaning Across Media: Cross media communication and co-creation.